The European mole (Talpa europaea) is a mammal of the order Eulipotyphla. It is also known as the common mole and the northern mole. This mole lives in an underground tunnel system, which it constantly extends. It uses these tunnels to hunt its prey. Under normal conditions the displaced earth is pushed to the surface, resulting in the characteristic molehills. It feeds mainly on earthworms, but also on insects, centipedes and even mice and shrews. Its saliva contains toxins which paralyze earthworms in particular. The mole has a cylindrical body and is 11 to 16 cm (4.3 to 6.3 in) long, weighing 70 to 130 g (2.5 to 4.6 oz). Females are typically smaller than males. The eyes are small and hidden behind fur, while the ears are just small ridges in the skin. The fur is usually dark grey, but the actual range of colors is larger, as due to the subterranean habits there is no disadvantage in having off-colored fur. European moles with white, light grey, tan, taupe, and black fur have all been reported. While moles are typically found in tunnel systems, the European mole is not exclusively an underground dweller. In the spring and early summer when the young moles leave their mothers' burrows they must find new territory. This forces them to leave their burrow and they can either make new tunnel systems or enter existing systems. In the summer time, however, they are likely to burrow much more superficially. The superficial burrowing could be due in part to the soil that is much harder, which makes burrowing a greater challenge. T. europaea have also been found to spend a lot of time at the sides of drainage lines and streams but do not inhabit flooded or dry soils. However, dry areas do become important when their normal habitats become flooded. Factors such as the type of soil, vegetation present, and altitude have no effect on the areas that moles choose to inhabit. The one factor that does greatly influence the mole population in a specific area is the abundance of earthworms. One would expect for the earthworm population to decrease as the moles feed, however no research has shown this to be true. The mole has a relatively short breeding season, in the spring. Mating occurs over a span of a few weeks in March and April, followed by a gestation period of four to five weeks. Most births occur at the end of April or at the beginning of May. The litter size ranges from two to seven. The lactation period lasts for four to five weeks but at the end of June, the young are usually required to leave the tunnels. European Mole can live up to three to five years. One common belief about moles is that they typically consume their own weight in food every 24 hours, but this is an exaggeration. Studies have been performed that show moles actually eat about half of their body weight in food each day. When in captivity, moles will eat a wide variety of food items including liver, mice, mealworms, shrews and maggots. However, they always tend to prefer earthworms to all other options. Studies have shown that T. europaea does have photopic vision, contrary to popular belief that all moles are blind. Two cone opsins have been found in the eyes of T. europaea but their function is still under investigation. In a study of the mole eyes it was found that Talpa withdraws when exposed to a flashlight and it can also perform light/dark discrimination tasks. The cone cells in the eye are unlikely to provide high-resolution vision but they could allow a detection of movement and some hue discrimination. It is suggested that in subterranean mammals vision is used to detect predators that have broken into the tunnels. In mammals the cues for hearing are usually based on inter-aural intensity differences, which occur as a result of the diffraction of a progressive sound wave by the head and pinna. They could also be based on inter-aural time differences that are present because of the distance between their two ears. Moles have no pinnae so they are thought to hear at low frequencies. In addition to this, their inner ear is unusual for that of a mammal due to the large trabeculation of the posterior ventral skull between the ears. The tympana of the ear lies almost horizontally and the manubrial tips are separated by a distance of 8 mm (0.31 in). The results of several studies confirm that there is good transmission through the European mole's head for a range of low frequencies. Because of this it is expected that there will be acoustic interaction at each tympanic membrane. The results of the study also suggest that the ears of this mole act as balanced pressure-difference receivers. This system has never been suggested for a mammal in the past, but reptiles, amphibia, birds, and crickets have been shown to have a direct air pathway between the tympana. In Talpa europaea there are several unique changes in ossification sequence in the postcranial elements. Many of the shifts are seen in the vertebral column, specifically the cervical and thoracic regions. The shifts allow the mole to have a more stabilized body axis and cervical region after they are born. After a mole is born and begins to develop it will begin to crawl around and dig. As a result of the constant digging action, elements of the forelimb that are associated with those movements will begin to ossify. Some elements in the hands of the Talpa, formally described as distal phalanges, are actually the first to ossify. These elements build up a groove for the distal phalanges but ultimately do not fuse with them. These bony elements develop directly, meaning they do not have any cartilaginous precursors. The extra-calcified elements are created from small, calcified particles that are found in the fibrous part of the flexor digitorum profundus. The particles then fuse later in life to form the solid element of the hand. Additionally, the sesamoid bone in the mole, sensu stricto, is a bone that develops within a tendon. It does have a chondrified precursor and it assists the tendon in transmitting force. The variance of morphology between species is very important to paleontologists as it can help define a fossil species. Unlike other characteristics that do not fossilize, like color and karyotype, dentition can be studied as it fossilizes well and varies from species to species. Studying dentition can be very beneficial in recognizing the differences between fossils and subsequently being able to classify them. 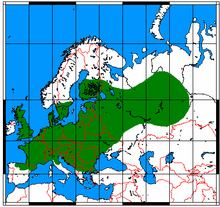 The Roman mole, Talpa romana, was once considered a subspecies of the European mole as they are of similar size. The only obvious difference between the two is that the Roman mole has skin-covered eyes and it also has a caecoid pelvis, whereas T. europaea has a europoid pelvis. Although similar in body, the dentition of T. romana is obviously larger in size than that of the European mole. Both the length of the tooth row and the individual elements are larger. Moreover, the mesotyle of the upper molars is generally divided. The dentition of Talpa europaea is small and the length of M1-M3 is less than 19% of the length of the condyle base. This mole also has relatively small molars for its size. ^ Hutterer, R. (2005). Wilson, D.E. ; Reeder, D.M. (eds.). Mammal Species of the World: A Taxonomic and Geographic Reference (3rd ed.). Johns Hopkins University Press. p. 308. ISBN 978-0-8018-8221-0. OCLC 62265494. ^ Amori, G.; Hutterer, R.; Mitsain, G.; Yigit, N.; Kryštufek, B. & Palomo, L.J. (2008). "Talpa europaea". IUCN Red List of Threatened Species. Version 2010.1. International Union for Conservation of Nature. ^ Mukherjee, Sarah (25 January 2008). "Searching for nature's tunnellers". BBC News. Retrieved 4 May 2010. ^ a b Mellanby, K. (1967). "Food and activity in the mole Talpa Europaea". Nature. 215 (5106): 1128–30. doi:10.1038/2151128a0. PMID 6061800. ^ Funmilayo, O. (1977). "Distribution and abundance of moles (Talpa europaea L.) in relation to physical habitat and food supply". Oecologia. 30 (3): 277–283. doi:10.1007/BF01833635. ^ Haeck, J. (1969). "Colonization of the mole (Talpa Europaea L.) in the Ijsselmeer polders". Netherlands Journal of Zoology. 19 (2): 145–248. doi:10.1163/002829669X00107. ^ Glosmann, M.; Steiner, M.; Peichl, M.; Ahnelt, P.K. (2008). "Cone photoreceptors and potential UV vision in a subterranean insectivore, the European mole". Journal of Vision. 8 (4): 23.1–12. doi:10.1167/8.4.23. PMID 18484862. ^ Coles, R.B. ; Gower, D.M. ; Boyd, P.J. & Lewis, D.B. (1982). "Acoustic transmission through the head of the common mole, Talpa europaea". The Journal of Experimental Biology. 101: 337–41. PMID 7166696. ^ Prochel, J. (2006). "Early skeletal development in Talpa europaea, the common European mole". Zoological Science. 23 (5): 427–34. doi:10.2108/zsj.23.427. PMID 16766861. ^ Cleef-Roders, J.T. ; van den Hoek Ostende, L.W. (2001). 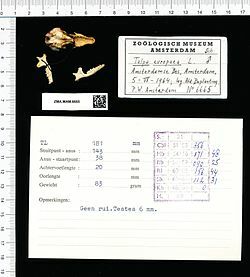 "Dental morphology of Talpa europaea and Talpa occidentalis (Mammalia: Insectivora) with a discussion of fossil Talpa in the Pleistocene of Europe". Zoologische Mededelingen. 75: 51–68. This page was last edited on 28 March 2019, at 14:28 (UTC).